There are all kinds of things I could write about right now. For some reason, the strangest array of topics is running through my head and I feel I want to tell you all about my curtain-twitching neighbours, or the first job I had, or the time I met Bill Bailey in the street, or even a great idea for a book I came up with. 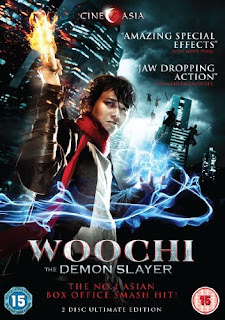 In fact, I think I want to write about almost anything except 'Woochi - The Demon Slayer'. I think this ailment might well be because every time I try, I have almost nothing at all to say. Before long, my head grows foggy and a kind of dull buzzing seems to originate somewhere in the back of my skull. I think this might be some sort of mental defense mechanism. The thing is, 'Woochi' isn’t a terrible film. It’s not even a bad film. It’s just *naff*. It’s terribly naff, like a horrid tank top, gaudy Christmas decorations or banal elevator music. To me, 'Woochi' is muzak in film form. It’s a time-travelling action caper with a wacky sidekick and a lot of stunts and quite a few people getting bonked on the head. Every other character is a bit dim or self-interested in a sort of faintly amusing way, and a lot of things get smashed up or broken. That’s about the size of it and trying to go into any greater detail would give the entirely false impression that the film has anything more to offer. The action sequences are often poorly edited and sometimes clumsily shot, rarely possessing any sense of excitement or urgency, while the plot, though obviously not supposed to be serious, has too many distractions and loose ends. It’s all a tiny bit sloppy. At no point does anything funny happen. I had to get up and take a break about two thirds of the way through this film and I quickly found that clearing out my spam folder was actually about as interesting. If I can reach for anything positive to say, it’s that 'Woochi' has perhaps one or two novel tricks or interesting moments, though I can’t say I remembered any of them by the time I ejected the DVD. Instead, I was left thinking that it could become some new standard in endurance tests, a measure by which somebody’s ability to simply slog it out is tested to the very extreme. If you haven’t had enough 'Woochi The Demon Slayer' by the time the credits role, then a whole DVD bleeds pure boredom: The standard making-ofs plus (for some reason) videos of the premiere and a press conference, plodding interviews, the typical mutual backslapping of everyone involved, photo galleries, a oh hello this is Paul’s brain I’m sorry I just have to get out of here I am leaving his body here if anybody wants it bye. 'Woochi: The Demon Slayer' was released this week and is available for purchase at Amazon.co.uk on DVD/Blu-Ray.